Factual error: Two passengers play a piano/vaudeville routine in the lounge for the officers and passengers. During its initial season (1936) Hindenburg had a lightweight aluminum baby grand piano on board. However, passenger accommodations were expanded over the winter of 1936/37 and the piano was removed. There was no piano aboard Hindenburg on her fatal flight in May 1937. Factual error: In Berlin, you see a Citroen HY. The car was introduced in 1947, more than a decade later. Mrs. Channing: Sugar, next time, let's take the Titanic. 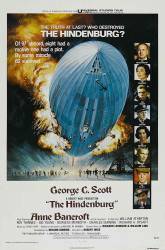 The Hindenburg explosion and fire towards the end of the movie combines filmed footage with actual newsreel footage of the disaster.